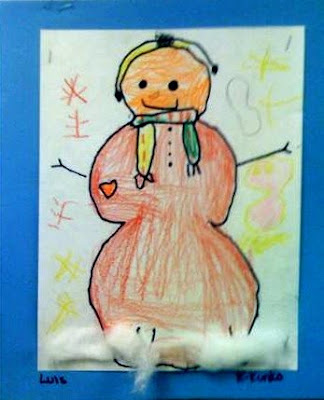 I didn't realize how much the full day kindergarteners would like creating their own snowman, but they really did. We started with a template. After that, they could go to town and make their snowman however they wanted. I like to call them "Personality Snowmen". This cool dude is wearing earmuffs. I love how neat the student colored. This boy is one of our ESL students, who really doesn't know much english at all. But, boy...can he color. He is a fantastic little artist for his age. We added cotton for the "snow" affect.